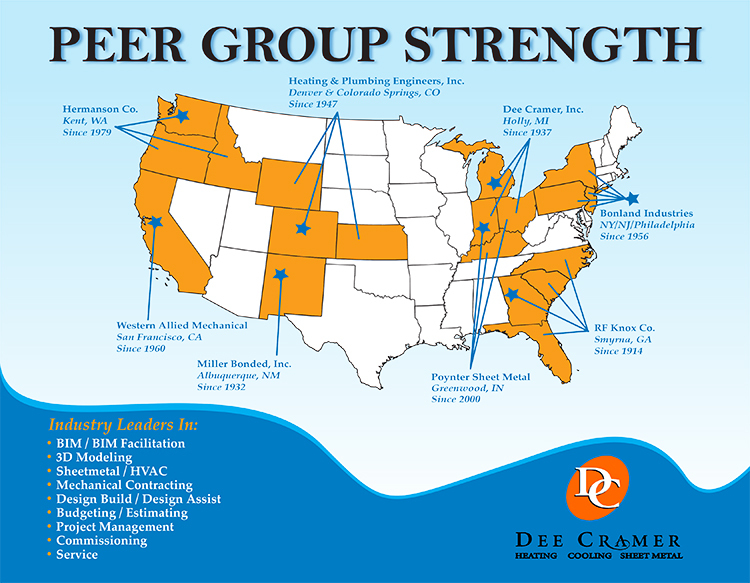 Dee Cramer, Inc. has enjoyed participation in one of the highest performing HVAC industry peer groups since 1989. Our Peer Group includes eight mechanical contractors, covering major regions across America. Our companies are bound together by core values, most prominently to support each other’s goal of becoming the finest contractor in our markets. Our methods include Peer Reviews, in which each company is periodically subjected to the top to bottom scrutiny by the members’ key personnel, resulting in a recap of the organization’s strengths and opportunities for betterment. This along with our key process summits give us crystal clear insight to how we can move our performance for our clients up to the next level of excellence. When you have the need for an excellent mechanical contractor any place in our country, please give us an opportunity to introduce you to our peers!